I use a lot of dunnage for my projects. It’s from freight shipped out of India and is usually some type of exhotic hardwood. Some pieces are a reddish hardwood. 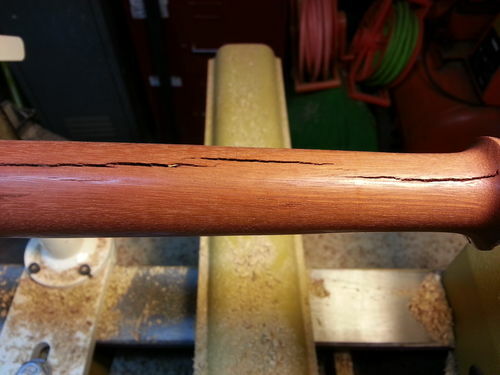 It has a very fine grain, is VERY hard, and every piece has cracks running down it. 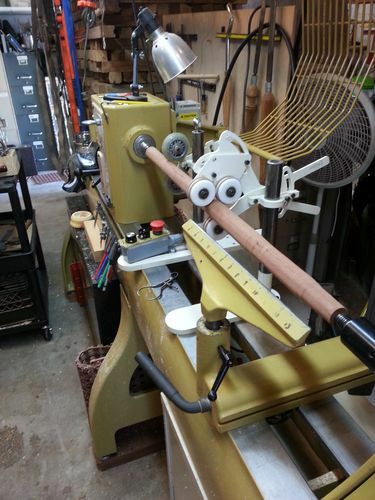 I have decided to only make mallets and other hard type things out of it. 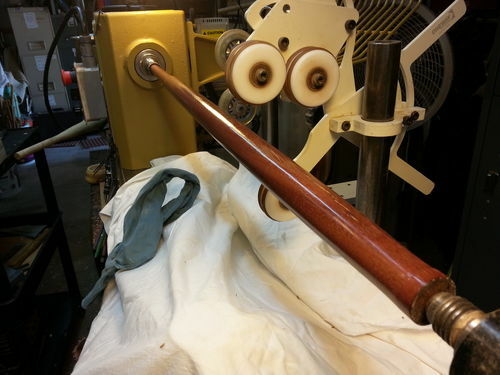 But I’d already cut a cane blank and decided to go on and make the cane. Besides I wanted to see how it turned out. I’d turned the blank to round a few weeks ago so this picks up from there. 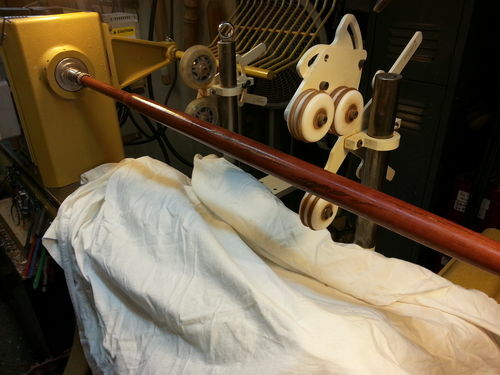 When I turn canes I use a spindle steady and a bowl steady. 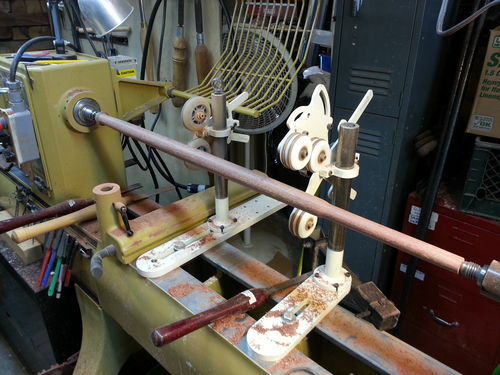 I use the bowl steady because I have it and in conjunction with the spindle steady it works well. When mounting either one I try to make sure they are at 90 degrees to the piece. 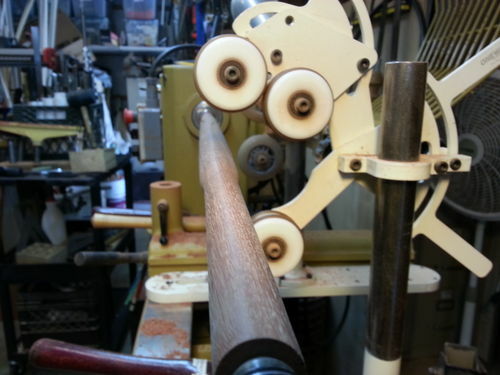 Whether rounding down or turning to final shape I always work from the tip of the cane to the handle. 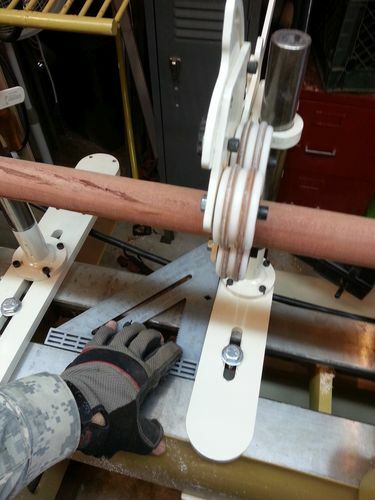 Turning the tip end to size. 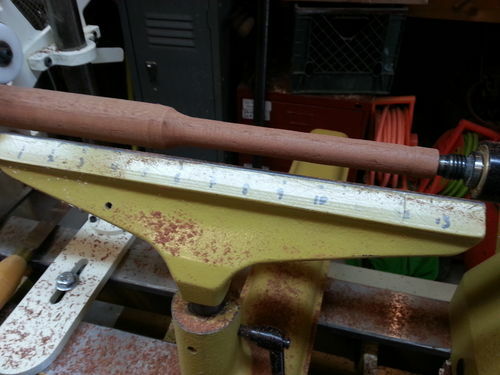 Because customers come in different sizes I make the bottom 6-8 inches the same diameter. That way I can cut them to size at the point of sale. In this case the tip end is 3/4 inches in diameter. Future tip ends will be 7/8 inches because it’s easier to get tips that size. 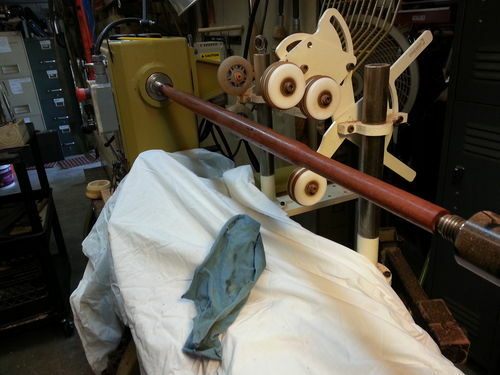 SOP for canes is turned, sanded to 320 grit, wiped on/wiped off shellac, polished on the Beall Buff system. Turning and sanding are worked tip to handle. But shellac is done when everything is turned and sanded. Shellaced. It’s 2# shellac, applied with an old acid brush I keep in the jar, then wiped off at slow speed while still wet. Then I kick the speed up and buff it with the rag to get any residue off the surface. 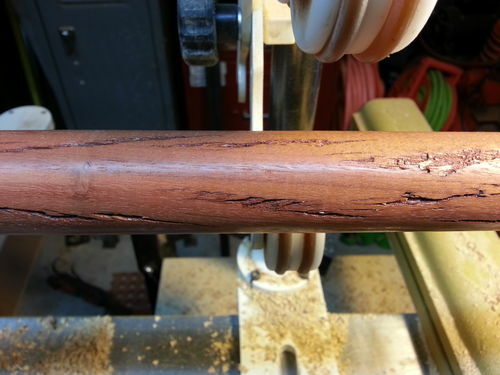 The idea is to seal the grain in preparation for polishing. 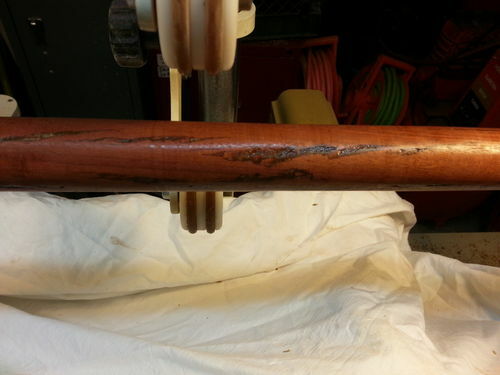 As I mentioned, cracks seem to be a characteristic of this wood. For this can I decided to fill the cracks. Partly as an appearance issue but mostly because the wood is so hard and dense that after sanding and shellacking the edges of the cracks were like knife blades. Seriously, sharp enough to cut skin (I know….I did.) I thought about using coffee grounds (probably should have) but decided to just use sawdust from the belt sander. The process was simple, rub sawdust into the crack, put in some superglue, spray on accelerator, repeat until filled/satisfied with amount filled, sand smooth. 2nd coat of shellac applied due to sanding of the cracks. Polished on the Beall Buff. I think the superglue hadn’t completely cured as the heat from the polish bubbled it some. On a plus note I brought a highlight to the cracks. Hey, If someone likes it enough they’ll buy it. Will post the finished and assembled cane later. 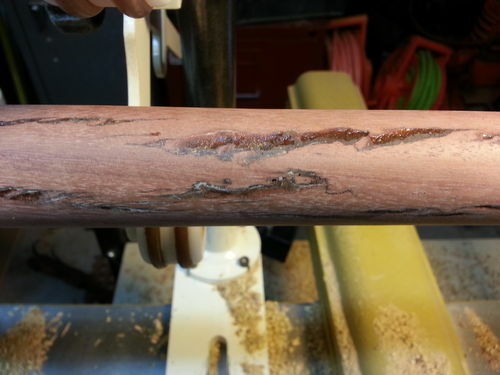 If anyone has any idea what this wood might be I’d love to know. This blog covers Pete's plight as he plows painfully past piles of junk on his journey to a jewel of a shop and a highly sucessful career as an artist in the tree. That is a REAL COOL Cane! 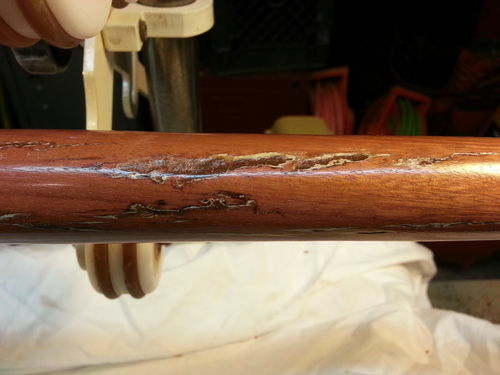 The way you handled those cracks was GREAT… worked like a charm… You Antiqued them! I think it is totally a Mysterious Red Wood. That’s my take. Nicely done Pete. 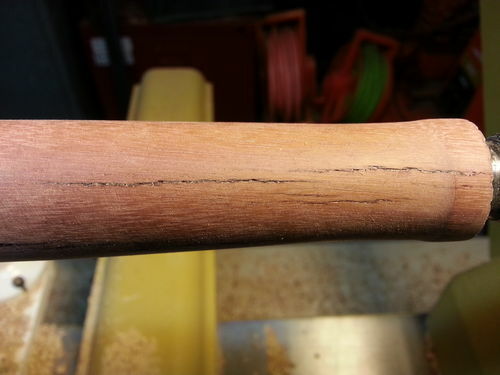 The mystery wood is really nice with a lot of like to the grain.